We synthesized the results of a coordinated study examining the spatial and temporal movements, genetic structure, and physiological characteristics of sympatric populations of resident and sea-run brook charr across eastern Canada. 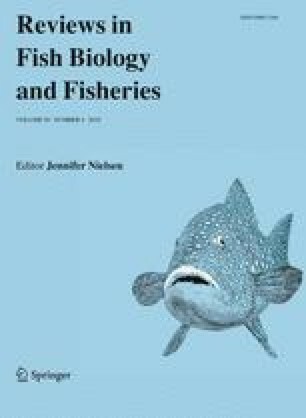 Our goal was to critically evaluate three working hypotheses that may explain anadromous behaviour in brook charr: (1) resident and anadromous forms have different phylogenic origins; (2) anadromy emerges from freshwater residents; and (3) freshwater residency emerges from anadromous individuals. Our synthesis is consistent with the conclusion that freshwater residency emerging from anadromous individuals is most probable. Overall, anadromy in brook charr is poorly developed and the tactic of sea-running may be described as partial, facultative anadromy if the species must be described in terms of anadromy. The sea-run tactic most probably results from the species’ propensity to move and disperse, the over-production of juveniles, an archetypical physiological ability to tolerate saline environments, and the persistence of critical habitats. When the spatial and temporal physical environments permit, the anadromous behaviour is expressed. The tactic creates an apparent fitness advantages related to growth, but it is not necessarily the only evolutionary stable strategy for a river. Most populations with sea-run forms are declining and successful conservation of sea-run forms will depend on managing harvests and more importantly, protection of the temporally and spatially complexity of critical habitats. We thank the many graduate students and their assistants who conducted the bulk of the field and laboratory work for our studies, especially D. Boula, V. Castric, D. Courtemanche, J. van de Sande, and M. Gautreau. Many organizations and funding agencies supported the research including the Québec—Ministère des Ressources naturelles et de la Faune, New Brunswick Department of Natural Resources, New Brunswick Environmental Trust Fund, Camp Brûlé, Zec Petite Cascapédia, ZEC Forestville, and Sussex Fish and Game Association. This project was funded in part by an NSERC Strategic Grant, 201893-97.